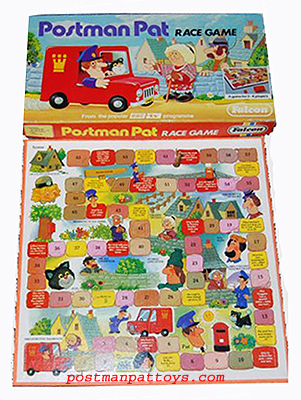 Possibly the first Postman Pat boxed game was the Postman Pat Race Game by Falcon Games Ltd. This was released in 1981, the first year of the show. The idea of the Race Game is to help Pat complete his rounds to get back to his house whilst meeting all his friends along the way. Some Greendale villagers just want to help but others like Reverend Timms will keep Pat chatting all day about the village fete. 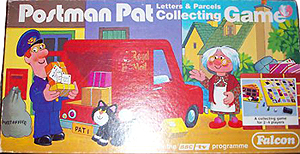 Another early 80’s game by Falcon was the Postman Pat Letters and Parcels Collecting Game. This had four playing pieces, four Postman Pat cards and 22 letter and parcel cards for Pat to ‘deliver’ round the playing board. From 1983 Michael Stanfield Games released the very similar Postman Pat Delivery Round Game. Cardboard stand-up Postman Pat figures were moved around the village of Greendale. The game included cards, a dice and tumbler. Michael Stanfield also released the Postman Pat Beetle Game. For 2 to 4 players the Beetle Game involved assembling Postman Pat jigsaw pieces to make Postman Pat figures. 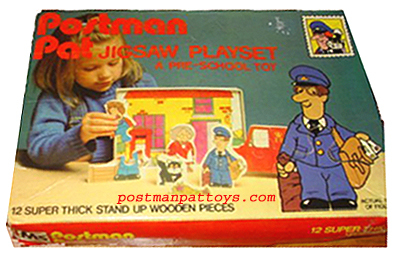 From 1985, again by Michael Stanfield (MS), was the Postman Pat Jigsaw Playset. This had wooden stand-up jigsaw figures of Pat, Jess, Mrs Goggins and Ted Glen as well as a wooden jigsaw stand-up Pat 1 van. Merit released a Postman Pat game entitled Postman Pat’s Magic Fun School, an eductaional game with four sheets of questions answered by ‘magic’.